You click on the image and after being redirected to the meme generator, you enter your name and gender, and the app generates a similar nonsensical story about you which always ends with "(Mike / Jane / Leo / Farouk) is smart. 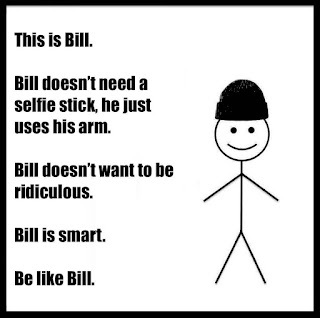 Be like (Mike / Jane / Leo / Farouk)"and has a stick figure sporting a bobble hat. But what if you could get your students write their own "memes"? Ask students if they've seen similar images (memes) in their Facebook feed. Put students into pairs and ask them to write a meme about their partner. Circulate and help students with the language, i.e. feed in appropriate lexis for students' memes. (5) "smart" can be substituted for another adjective, but I'd keep "smart" if you don't want your students to write nasty things about each other. 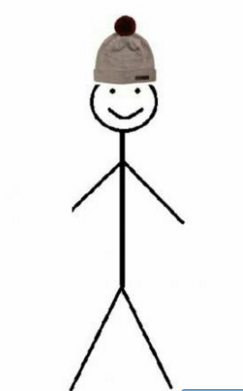 Students write it on a piece of paper and draw a stick man with a bobble hat. After they've finished, hang the drawings on the walls, ask your students to walk around, read the texts and choose the best one. Write the text in the text boxes. Click on "More options", then +Add Another Text Box (x2) so that you have a total of 6 text boxes. Tick/check "Enable drag&drop and resize"
Make necessary adjustments or edits by clicking on "Change settings" at the bottom. When you're happy with the result, you can save the image (right click + Save image as...) or use the Image HTML to embed it into a class blog. Silvia thinks her English isn't good although we all know it's not true. Mark lives close to the school. Mark doesn't take the bus to school; he walks. Hope your students have fun writing their own memes. If you can think of more pairs of collocations or phrases students can use as prompts, please add them in the comments below. Bear in mind the level though. I love it! This is such a great idea, Leo. Thanks for sharing a lesson plan to use it. Found your examples useful. I´m doing it in my classes, thanks! Great idea! 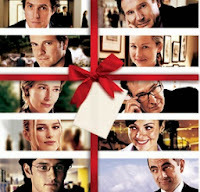 I'm definitely using it with my pre-intermediate class to review the present simple tomorrow. He doesn't change his views easily when he listens to other people. I found it a nice way of testing their knowledge. That's a really good idea: personality adjectives for higher levels. I suppose you gave the adjectives as prompts and the students had to write descriptions ("He doesn't change his..."). I'll try that too. Thank you for the suggestion. That's what blogging is all about - exchanging ideas. You're most welcome. Yes. I gave them the adjectives as prompts. 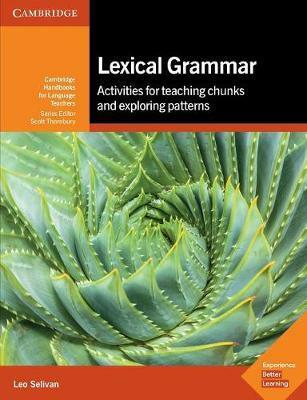 I've tried the grammar activity twice in my pre-intermediate classes. It was really beneficial. 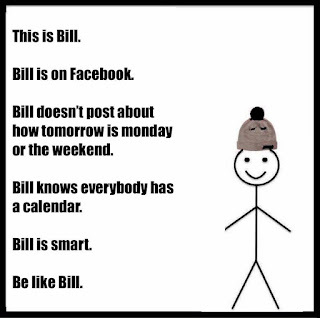 I gave each student a blank "Be like bill" sheet and asked them to write their sentences and put them around the room. Then, I had a gallery walk activity. In pairs, they read their students sentences and expressed their opinions; whether they agree or disagree with what they colleagues wrote. Had an error-correction stage afterwards. They students really enjoyed the activity. It was much more fun reviewing the present simple that way. A definite yes for all levels. Am always aware of the irony of teaching conditionals to 12th grade students who still make mistakes with the "S" in present simple. It's something that has been shown to be problematic for all students of all levels of all linguistic backgrounds. So nothing to lose sleep over. It will be acquired eventually. Amazing activity, thanks for sharing! This can be a difficult thing to break but I believe it is really important to stress that mistakes Are lesson a and We should not be afraid to make them. Getting this message across to students is very important. Worrying about them just makes things worse. When someone is relaxed, they improve. Check out my blog for teachers and learners. I have a project about telling present simple tense.and I need some different ways to improve the students' skill on this tense.so it is very enjoyable and benefical study for my Project.so, Please accept my grateful thank. Supplements For Fitness that classifies the best among the worst. Sometimes, looking more closely, you will also find that these websites also sell .